R01 Flat continuous braid. Made of soft polypropylene. 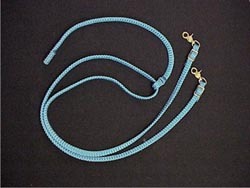 R02 Soft flat braid polypropylene split reins with leather slappers on ends. R03 Polypropylene continuous reins with Beta or Biothane ends to match your Halter bridle. 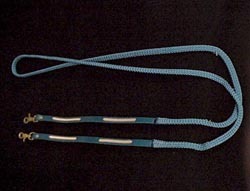 R04 Polypropylene continuous reins with Beta or Biothane ends with contrasting color diamonds to match your halter bridle or reins. R05 Flat continuous braid reins with 30” sliding romel. Made of soft polypropylene. R06A Desoto Gripper Reins “These are Awesome” Just the right weight and thickness in your hands. Special rein grip texture produced by the Biothane Company. We add Beta or Biothane on the ends to match you halter bridle and or breast collar. R06B Desoto Gripper Reins with safety buckle in center. 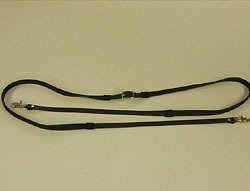 R07 ¾” wide Beta continuous reins with leather stops and safety buckle in middle.